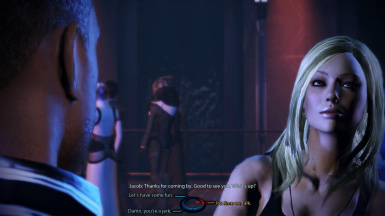 BackOff is a dialogue and story overhaul for Mass Effect 3 that focuses on relationship mechanics between Shepard and potential Love Interests (LIs). 1. BO is the creative work and property of Giftfish. I retain all legal ownership and rights related to title, copyright, intellectual property, and distribution of this mod and its contents. 2. This agreement grants you a license to use BO; it is not a transfer of ownership. B. You may not distribute, re-use, convert, translate, update, or modify, BO or any of its contents without my express permission. C. You may not release any patches for BO, including intermod compatibility patches, without my express permission. This includes but is not limited to: direct use of files or assets (theft) and/or recreation of file edits (plagiarism) in a way that replicates the mod's experience in game. The only way intermod compatibility with BO may be achieved without my express permission is via omission of the conflicting files in the incompatible mod. D. You may not use various programming or modding methods to hook into and alter BO's in game experience without my express permission. 4. BO is for noncommercial use only and is provided free of charge. You may not use this mod as part of any activity in which you derive revenue, monetary compensation, or donations. 5. You use BO at your own risk; I am not responsible for any damage to your game or PC by use of this mod. Technical support may be provided but is never guaranteed. 6. BO is hosted only on Nexusmods.com. Pirated copies obtained via private link or any other site are suspect and could contain malware or unauthorized modifications that will interfere with normal functionality of the mod. These copies are considered void and will not be supported. Users of unauthorized/pirated content may be banned from any present and future mods I create. Thanks to Warrantyvoider for his DLC Patcher. 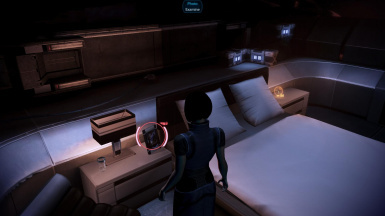 Bugfix for Citadel DLC users involves Liara's apartment visit pre-requisite. Fixed premature ending to Jacob's main Gellix conversation, if his father was not arrested on Aeia, and the player didn't set bools manually with the Gibbed Save Editor. Fixed broken conversations for Kaidan in the Starboard Observatory/Crew quarters for Leviathan DLC users. Fixed potentially (not reported) broken dialogue in the cockpit for Leviathan DLC users. Fixed two lines of new audio in Sam's CIC convos for Citadel/Omega/Leviathan DLC users. 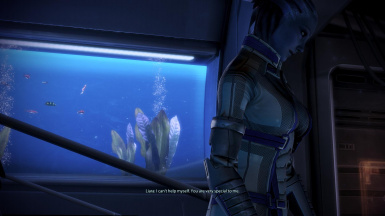 Fixed broken audio exclusive to BroShep in Liara's LI-specific Time Capsule convo. Incorporated contents of BugFixA for Liara's LotSB rekindle in her office (bool fix). Assorted TLK edits for inaccurate subtitles. Scene flow improvements to Brynn's main dialogue on Gellix. Added slight scene flow improvements with Jacob/Brynn during the Gellix intro. Slightly improved the gesture issues during Liara's LotSB rekindle in her office. --Initial release. See the Release Notes for details. 07 Sep 2018 | BO v1.2 update is available, see Announcements sticky! Put a little ME1 and ME2 back into your ME3. Dialogue Wheels. BO returns flexibility to the dialogue wheel, similar to ME1 and ME2. "Agree" should not mean: "I want to date you", when "Disagree" is the only other option. 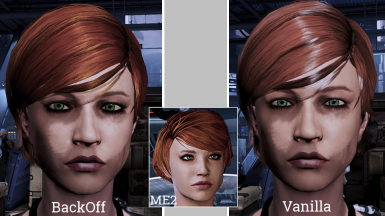 Removal of the center-right, neutral wheel option in ME3 resulted in paragon players often getting "ninjamanced" by LIs. BO implements many new dialogue wheel options and alters the text and choice locations so implications are clearer prior to the choice. Conversations. 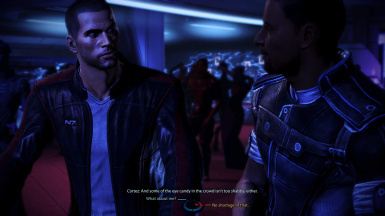 BO adds variation to paths when possible, creating a greater difference between friend and romanced Shepard. It also improves conversation and scene flow, and restores cut content when possible. Characterization. In certain cases, BO removes content that feels out of character or detracts from a scene. It also tweaks email tone, and implements new romance-specific email variants for certain LIs, when warranted. Autoflirting. 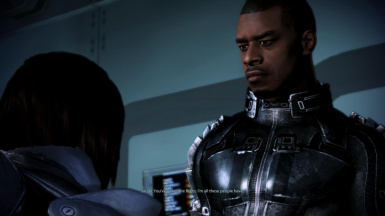 BO puts flirting for FemShep back into the player's control, by allowing them to initiate the behavior. Imported ME2 LIs. When both ME1 and ME2 LIs are present, ME3 gives priority — especially on Mars — to the ME1 LI. This mechanic has been tempered, and the player given a bit more control as to how the story plays out. ME2 LIs are no longer demoted to "cheatees". Bug Fixes. BO fixes hundreds of bugs with subtitles, conversation pathing, camera work, animations, lighting, and much more. While BackOff is a "romance mod", it's also handy for minimizing the presence of romance-related content. It does this by putting in-game flirting in player-control, making it more difficult in certain cases to trigger a romance, and reducing how certain LIs can feel "pushed" onto the player. If you're goal is to play ME3 in a way where Shepard is "all business", you should give BO a try. Right now, this works best when the PC is female. Below is a very brief summary of character changes; for more details see the BackOff v1.0 Release Notes in your download or on Google Docs. 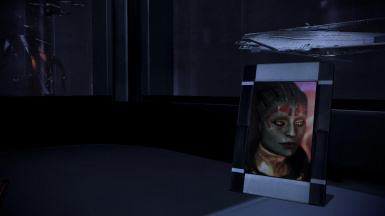 AETHYTA, more accurately perceives Shepard's relationship with Liara. ASHLEY, remembers ME2 romances. BroShep has two new opportunities to "rekindle", which affects their interactions pre-coup. Her hospital convos have been significantly improved in flow and appearance. JACOB, has had a total relationship overhaul. His characterization has been altered to be more in line with his ME2 self. The relationship hasn't been restored, but FemShep now has agency. Bad breakups have consequences, faithful rekindlers may see a light at the end of the tunnel. Includes Citadel DLC. 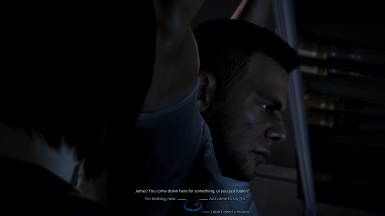 JAMES, clamps down on flirting, unless FemShep says otherwise; he's also bit more modest. JAVIK, will remember Kelly, Jacob, and Samara, when trying to seduce FemShep. JOKER, has been informed of Jacob's reaffirmation of character. FemShep will remember a romance with Thane prevents her from hooking up with Joker. 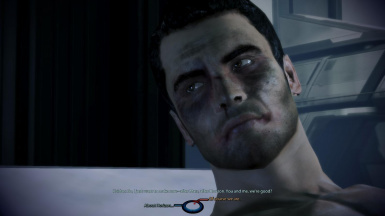 KAIDAN, has had an attitude adjustment on Mars, in Huerta, and on the Presidium. FemShep has more agency and has rediscovered her backbone. Gay romances now have more relationship-building opportunities prior to the date. KELLY, discovers she should always be in ME3! She can now be professional, flirty, or committed. When committed, she expects the same of Shepard; she's now a real love interest. She also has less "appearance amnesia", and a slightly more adept stylist. 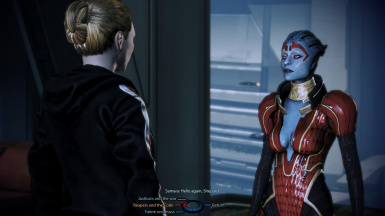 LIARA, is much less aggressive, and only gets one "date" unless romanced. She respects ME2 romances, unless fully rekindled on the Normandy in LotSB. Once rekindled/romanced, she no longer has relationship amnesia. 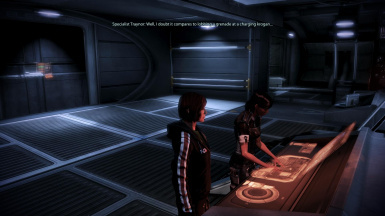 SAM, remembers she's a subordinate like James, and lets FemShep flirt first. She shares more details of herself the closer they get. No Citadel DLC content. SAMARA, behaves slightly differently depending on ME2 history. She will also consider Shepard's recent rekindles with Jacob and Kelly. STEVE, is less ambiguous about his interactions with Shepard. Like other LIs, he will now respect Shepard's existing romantic relationship. THANE, is not edited directly by BackOff, but BO and ThaneMOD will work together to influence FemShep's relationship mechanics. Note: LIs not edited directly will still be affected by plot changes to some of the above characters. For example, a Shepard with an ME2 Garrus romance will no longer experience certain dialogue with Aethyta regarding Liara. These edits are to Aethyta, but they affect Garrus's relationship content by way of Liara's. BackOff is a DLC mod, which makes installation and use very, very simple. Veteran users of my mods know that I include ample documentation in every download. This documentation will answer 99% of user questions, as long as you read it. Be aware that reading this description is not a substitute for reading the supplied documentation. Key requirements are listed below to help you decide if you want to download the mod. English. BO is made for English localizations, only. It is an EXTREMELY dialogue-heavy mod and other localizations are incompatible. I do not guarantee functionality, nor can I provide technical support for usage with other localizations. Do not ask. New Playthroughs. BO is for new playthroughs, only. This is non-negotiable. It needs to set new plot data to work properly and these plots will not be set on an existing PT without BO installed. See the Install Guide for further instructions. Both the guide and the Release Notes can be downloaded here and are available on Google Docs﻿. BackOff is a large overhaul, and like any overhaul, comes with the drawback of compatibility issues. However, choosing to deal with these issues will result in a rewarding playthrough. BO is compatible with any other mod that doesn't change the same game assets. Users should compare files across their DLC mods to check for themselves. Other DLC mods can override BO if they have higher "mount priority". As a result, BO will require various patches to work with my other mods. Those patches may be available on BO's page or the other mod's page. For more information on compatibility, conflicts, and translations, users should read this article on Nexus, consult the BO Public Folder on Google Docs, and read this page on the ThaneMOD website. Keep in mind that this information is not exhaustive. It is ultimately up to YOU to research the mods you choose to use and determine if they are compatible with BackOff. Modders interested in creating patches or translations for BackOff should read more here. BackOff has undergone a large amount of testing, and no bugs are known at this time. If you run into any problems, use the information provided here before reporting. BO v2.0, if it occurs, is a long way off. Slotted for me to work on after both ThaneMOD 3.0 and ME2Recalibrated v2.0. That said, folks are free to toss up ideas of what they'd like to see. I'd be focusing on the LIs not covered in BOv1.0. BackOff Testers. Deager, Dineboo, Elvie, JohnP, Kinkojiro, and Nephtysmoon for tracking down bugs and providing helpful feedback. Barddoc1992. For ideas, feedback, intelligent discussions, editing, and general moral support. Deager. For help with testing, providing feedback, and CEM/LIME compatibility. Heff. For making the incredibly useful ME3Logger, providing troubleshooting support, and for fixing the Paramour script for Thane. HJF4/Inquiring. For allowing use of the initial version of "James Antiflirt" in ThaneMOD, which helped give rise to BackOff. ME3Explorer Team. For making ME3Explorer, the best modding tool for ME3. MrFob. For helping with ThaneMOD, which basically started my modding career, and continuing to help me with all those pesky audio issues, lol. Nephthysmoon. The best tester ever. Thanks for your countless hours testing, frapsing, and uploading footage to help me test Citadel DLC edits for Jacob (I don't have the DLC). You deserve a huge thanks from Jacobmancers. Many thanks for all your helpful input on Kaidan. TankMaster. For creating your awesome Natives Editor. This mod would not have been possible without it; it makes story changes possible. ThaneMOD Fans. For your patience over the last year and a half as I've worked on BackOff. Thanemancers know that a large part of the reason I started BackOff was to grow my skill with dialogue and scene editing for Thane. I'll be getting back to our favorite drell soon. Promise.